The New Englander identity is one Stephanie McCaffrey could never shake off, and nor would she want to. Having spent her young life around a city decked out in winning sporting heritage, the Chicago Red Stars forward has flown the Boston nest in search of some champion consistency of her own, with recent starlit spectaculars to add to the soundtrack reminders of her heartland. In the final flickers of the U.S. Women’s National Team’s 3-1 win over Brazil in Orlando in October 2015, the player arriving at the back post to put the shine on the World Cup Victory Tour result was a debutante. It was the calendar year of Steph McCaffrey’s rookie National Women’s Soccer League (NWSL) season for her hometown Boston Breakers, with whom she’d also netted on her first appearance, shimmying and arrowing a terrific effort into the far corner at the Portland Thorns on opening weekend. There have been times in the former Boston College standout’s early career when she has felt like she was soaring, while others have had her stuck too low down the gears for her liking. The driving runs and the finishing ability have always been there, but after a first taste of the NWSL playoffs with Chicago last year, she’s set on filling the gaps to help bring the silverware she spoke of when she was drafted two Januarys ago. Last season’s NWSL Championship game went way beyond the 90, as the underdog Western New York Flash won the shootout after a last-gasp extra-time leveller against the Washington Spirit at Houston’s BBVA Compass Stadium. For Steph, she is rapidly approaching her third season in the league, off the back of herself witnessing the improbable unfold just a few miles away from the scene of that NWSL showdown. A staunch New England Patriots fan, Winchester-raised Steph saw her team make history as they overhauled a 25-point third-quarter deficit to beat the Atlanta Falcons in overtime at NRG Stadium in February’s Super Bowl LI. Alongside the ecstasy of James White’s game-winning touchdown, Steph explains how the halftime show added a grand-scale music memory to her Patriots picture-book. “Right now, I’m actually on a Lady Gaga kick. I’m taking it back, which is very strange, I don’t usually do throwbacks, but I saw her play at the Super Bowl and loved her. On top of Steph growing up around the culture of Boston’s sporting institutions, you don’t make it all the way up to pro and international level as a soccer player without knowing just how incredibly sport can twist and turn. This year’s Super Bowl turnaround, however, was quite something, and with Steph now living far from home for the first time in her life, being in the 70,000+ crowd as it all happened was made all the more significant with her family alongside her. Between them, the McCaffreys were scattered around the emotion chart with the Pats so many points down. While the ‘Dirty Water’ of home won’t fade out, Steph changed up the track last July with her move to The Windy City, putting herself amongst a new rhythm she hopes will guide her on a steady ascent. “I feel like I have lacked consistency in my career. I think there are times where I’m doing well, scoring goals and being dangerous, and there are times where I kind of fall off a little bit. Placing fifth all-time in goals (32) and assists (26) by the time she finished up at Boston College, Steph had felt ahead of her Red Stars switch that she needed to burst the bubble of what she was accustomed to. The former Breakers number nine had her 24th birthday last month and has been hard at preseason training with Rory Dames’ squad. 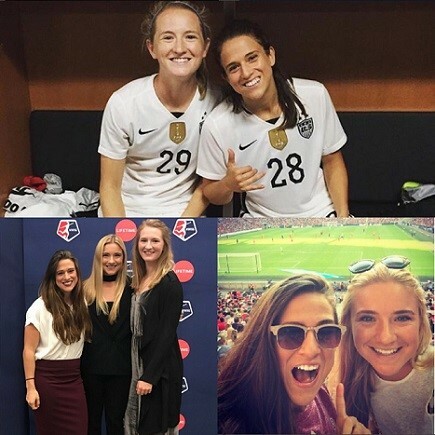 Back in Boston, her recent housemate was long-time friend and ex-Breakers teammate Kristie Mewis, but while there were a small amount of familiar faces when she arrived in Chicago, it’s been very much a stride out of the comfort zone. “I knew nobody here. I mean obviously, I had played with Danny (Colaprico) on the youth national teams, I knew Alyssa (Naeher) and I’ve been in camp briefly with (Christen) Press with the full national team, but besides that I didn’t really know anyone. “I have no family here, I have like one friend here, so it’s a huge change. In Boston, I couldn’t walk around two days without running into someone I knew growing up, and here, I’m really on my own. In any team that thrives, you get to know the tendencies of your counterparts, with the greatest soccer examples of that being when you develop an almost telepathic understanding of where each other will be at any given time in a game. It may be possible to have an impact out on the field without delving too deeply into the lives of your teammates in your free time, but it makes a world of difference to be part of a group where you feel embraced and at ease. At Chicago, some very notable experienced names have bid farewell in recent seasons, though there is no shortage of personality to go with the talent in the present-day setup. In amongst the many Red Stars who’ve featured on here, there was a 2015 rookie standout who returns this year after an offseason loan at Adelaide United. The talented forward in question struck seven goals last season and Steph explains how she has also been on the front foot with bringing the gameday heat. “The team DJ is actually Sofia Huerta; she’s the majority DJ and then whenever Michele Dalton gets a chance to get her hands on it, she will. I’d say Sof’s our go-to. Capped six times by the U.S. at senior level, Steph was acquired from Boston by Chicago on July 22nd in exchange for the Red Stars’ two highest second-round picks in the 2017 NWSL College Draft, one each in the third and fourth round, and an international roster spot. In a side that went on to secure their second consecutive postseason berth in 2016, she came up with a pair of goals and appeared in the narrow extra-time loss to Washington in September’s semi-final. Making her presence felt in the final third will always be a target, although she won’t be putting herself forward to challenge Sofia Huerta or any other playlist aficionados. Despite that, there are most definitely occasions when Steph’s connection to music is in full flow, with a little help from Bluetooth. “Sometimes when I’m doing technical work or shooting on my own, it can get pretty dry, just hitting ball after ball. I’ll put on Bose wireless headphones, so you can just put them on and you don’t even notice. “I’ll listen to music a lot and just have my phone off to the side; kind of like zone out and do some technical work. I feel like sometimes when you listen to pump-up music, you get so hyped up you forget your job and what you have to do, so for me before games it’s about staying as calm as you possibly can. A former Buckingham Browne & Nichols School student, Steph’s soccer exploits saw her named the Independent School League MVP in 2008 and 2010. There can be any number of reasons why we might turn to a song in a certain moment, with nostalgia of younger days and the people who shared in it with us guaranteed to be high on the list. The first and most memorable entry on the hit parade of Steph’s childhood came all the way from Ontario (and then whichever store Gina McCaffrey picked it up from…). “It was Shania Twain, that’s why I still love her. My mom bought it for me and we’d sing songs in the car and it was also my first concert. An All-ACC First Team selection as a junior and a senior, Steph became a team captain at BC along with fellow attacker McKenzie Meehan and goalkeeper Alex Johnson. Also an All-ACC Academic Team honouree, she was integral in the memorable 2013 season, as she and Meehan registered 32 goals and ten assists together as the Eagles made the Elite Eight of the NCAA tournament. Two years before that, freshman Steph had to make herself heard in BC tradition. One of the standout performers of BC coach Alison Foley’s two-decade (and counting) tenure, Steph became only the fourth player in program history to reach 90 career points, leading the team with seven assists and adding six goals in her senior year. You say goodbye to a lot when the lights go down on your college years, and hidden away in Steph’s memories of that era is a pregame ritual that allowed a tiny bit of freedom for expression! Lady Gaga’s Super Bowl choreography might have been a touch more polished than that, but those BC freakout intervals were, in their own unique way, another worthy example of sport and music coming together. There is a similar link in many of the shows Steph sees, as Red Sox territory usually provides the backdrop. “I went to Zac Brown Band at Fenway Park and I usually go every year. When I’m in Boston, if there’s a concert at Fenway, I’ll go to a lot of things there. “I’m not a huge concert person but when I do go, it’s usually country, because it’s in the summer, it’s fun. I don’t love Justin Bieber’s music, but I would love to see him live. With Steph seemingly passing the preseason test in college with her freshman Madonna rendition, that effort was basically her demo tape, so we need a first official single. The rules are that it has to be a cover version and she needs to collaborate with one or more of her career teammates. 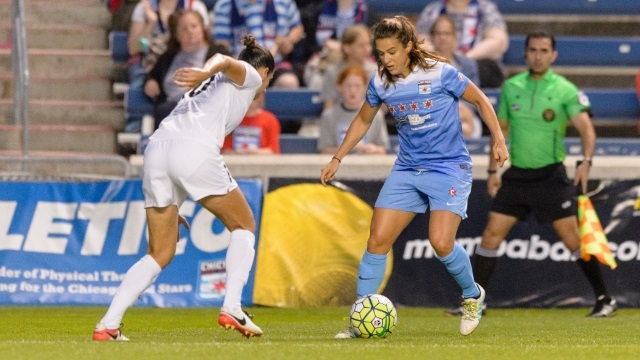 She goes for one of the NWSL’s premier up-and-coming midfield creators, a Red Stars colleague who would probably prefer to swerve this pass! Steph went into her rookie season at the Breakers having been in La Manga, Spain with the U.S. Under-23s as they won the 2015 Six Nations Tournament, beating Japan, Norway and England. 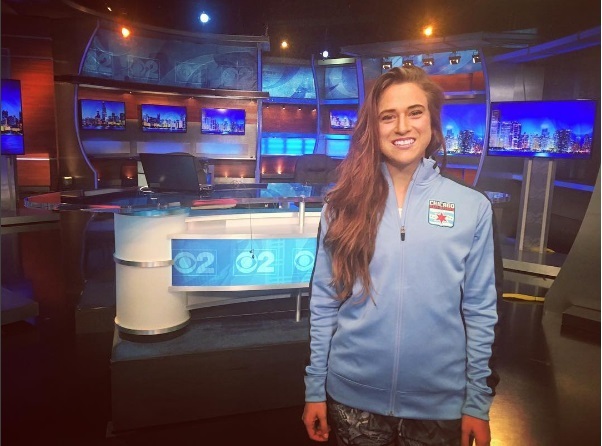 She had also spent time training with the full team in January of that year in California, so she headed into year one of her professional career in great heart. Playing the previous two summers on the Breakers’ College Academy team, she scored 23 goals, so it felt a natural progression to represent Boston in the big league. Steph recalls the Breakers defensive mainstay who set the vibe before kick-off, as well as the midfielder with the moves. “DJ Julie King – I always search her Spotify account. I know when I was on the Breakers with Kristie, she was a big dancer. Those two players are prime examples of the longer-lasting connections made in Steph’s career so far, and together with Kristie Mewis and her North Carolina Courage midfield sister Sam, she has started to branch out. The Bostonian trio created Sporting Chic, an online lifestyle blog offering insight into their lives and laughs as NWSL players, fashion features with more realism and relevance, as well as recipes, stories on emerging female athletes from around the U.S. and more. Steph, who brings her decidedly unique take on certain situations to the Sporting Chic table, details the wider purpose and backstory to the project. “We just thought there was a lack of community and media for all female athletes; like there’s community for just women’s soccer, or hockey or whatever. What we kind of noticed is that not only is there nothing for women’s athletes, but the different sports with women’s professional teams are really disconnected. Dubbed ‘The Ragamuffin Genius’ by her Sporting Chic peers, Steph also proclaims that ‘the only thing quicker than my wit is my first three steps.’ Kristie Mewis already had two seasons of NWSL play to her name, but when the 2015 campaign began, she had been joined in the league by Steph and her sister. Although Sam, a champion last season with Western New York, went to college over on the West Coast at UCLA, Steph had known her for many years before, and she explains how her friendship with both sisters developed. “I kind of started getting to know both of them at the same time. When I was a freshman at BC, Kristie was a junior, and so we started becoming pretty close friends fairly quickly. “At that same time, I was going to U20 national team camps with Sam, so it was an interesting dynamic. Me and Sam didn’t really know each other, because we grew up on separate club teams that were actually arch rivals, so we were kind of hesitant of each other! “I was over at their house a lot because Kristie and I had gotten to be such good friends at BC and then it just kind of took off from there. You meet a lot of people in women’s soccer that you find you’re friends with because you like them and you have the same schedule, but Kristie and Sam I think are a much deeper level than that. Majoring in Finance at BC, Steph graduated from the Carroll School of Management and according to the Sporting Chic website, some of her time is spent listening to finance podcasts. That may or may not be entirely serious…it can be hard to tell. “I just love comedy and joking around, and I think what good is life if you’re not making people laugh? I have always been interested in stand-up comedy and writing comedy, so I’ve kind of taken over the laughs section of Sporting Chic. “The reason I think I’ve been so inclined to stay with it and post all the time is it’s truly what I like to do. I mean, yeah, I was a Finance major, and I don’t know how that will tie into my future, but I think it’s safe to say, for me, it’s a lot more fun to write about things that are funny with my mom or that happened to the three of us than it is to go crunch numbers. 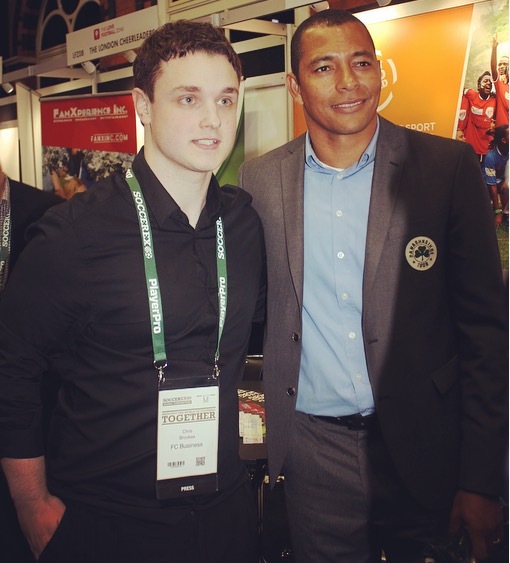 For the vast majority of us who’ve grown up loving the game, we would like to think that every player we watch perform at the top level really does adore soccer as much as we do. While that is undoubtedly true in many cases, there are some who choose not to be so immersed in the sport when they’re not on the field, preferring instead to give themselves some distance from it. Steph does like to take it in when she can and given the opportunity of anyone to train one-on-one with and learn from, she’d want to draw upon the playmaking finesse of one of the greatest midfielders to ever do it. There is a strong argument that any true lover of the beautiful game and its very best intricacies would take any opportunity possible to watch Barcelona, although when it comes to Steph’s favourite teams to watch, she actually veers more toward the East End of London than Catalonia. “My dad moved over to London five years ago for work, and so my mom and the rest of the family goes to see him all the time. Back then, I liked watching soccer but every time I go over there now, I’ll try to go to a game. “Because of that I’ve become a very rabid Premier League fan, I love it. My favourite team is actually West Ham; I love their stadium, I love the culture of their fans, they’re hilarious. Back in 2010, Steph went to the national finals with her club team FC Stars of Massachusetts and would also be named an NSCAA high school and club All-American that year. When asked about advice, reassurance or anything at all she’d have in mind to say to the Steph who was just starting out with soccer, she highlighted something she remembers from some of her earliest soccer experiences. “I would tell them to do as much technical work as they can and to encourage as much free play as they can. I think when I was ages ten to 15, there was so much onus on winning the Disney Tournament, or winning these tournaments that, realistically looking back, didn’t even matter. “If you have all this pressure on you to win this game for your club team at U13, you’re going to do what’s successful and what works, and for me, just an example, that was dribbling with my right foot basically into the net. I didn’t do as much work as I should have with my left, I didn’t do as much perimeter finishing as I should have. It’s pretty hard to escape sports in Boston and the same is true in the McCaffrey family. Both of Steph’s brothers have played Division I college football, with older brother, Jimmy, doing so at BC and Mikey currently at Holy Cross. Steph’s father, Jim, played basketball and was drafted in 1986 by the Phoenix Suns, while her mother, Gina, ran track, and Steph herself began with Little League Baseball. From a fan standpoint, she supports all Boston teams and will typically get to three Celtics and three Bruins games a year, but the Patriots and their ‘Boston versus everyone’ ethos are what she loves most. She was there as Tom Brady was named Super Bowl MVP for a record fourth time this year and ‘TB12’ understandably ranks high on her athletic inspirations list, as do some iconic USWNT names. “I think I definitely look up to Brady, not because of how well he’s done but I think the way he carries himself and every single game, regardless of how many touchdowns he threw, he always deflects compliments back to his teammates. That’s why, behind all of my ‘#FreeBrady’ jokes, I look up to him. “I definitely looked up to a lot of women soccer players growing up, too. I loved Mia Hamm, I loved Julie Foudy, I looked up to Abby (Wambach) a lot. Those National Team players had a hand in making sure it was soccer Steph would stay with, and despite the more recent struggles for her hometown Boston Breakers, which could of course turn around this year, it’s a club with as notable a name in women’s soccer as any. With all those who’ve worn the blue since the club’s Women’s United Soccer Association (WUSA) beginnings, Steph joined an elite group when she represented them for the first time. She would score three and set up three in her rookie year, although the team finished last of nine in Tom Durkin’s second and final full season in charge. Last year, former Liverpool Ladies manager Matt Beard – who has since made many changes to the squad and setup – arrived but couldn’t help bring a change of fortune, with a tenth-placed finish ensuing. Even with the unquestionable pride that she had in representing Boston and playing for friends and family amongst the supporters, could Steph properly enjoy the experience with the team struggling so much in her time as a Breaker? “One thing that I’ve always said and I’ll say for the rest of my life is the Breakers have such great people in the organisation. Obviously, the goal in professional sports is to win, and it was incredibly disappointing in the season-and-a-half that I was there that it didn’t happen, but to say that I didn’t enjoy my time there would be completely untrue. With Steph’s complete focus now on bringing that first championship to the Red Stars, the hometown spirit will be along with her for the ride, wherever it leads. In her second-half Orlando appearance against Brazil on that aforementioned National Team debut, Steph arrived to put away a deep Megan Rapinoe cross from the left that the Brazilian keeper had been unable to intercept. Now where have we heard all that before? If all goes to plan, her hard work and progress at club level will help bring many more moments like that in her nation’s jersey. In the meantime, you can expect plenty more of the lighter side, as seen when she and Sam Mewis squeezed into an ice bath with Carli Lloyd in the ‘Doing What Carli Does’ video. Without making it too much of a spoiler, the younger Mewis sister would also be there for the fun in this closing scenario. Each player to feature on here is asked to wrap up by picturing themselves playing in a small-sided game, with four teammates from any time in their career to join them in their lineup. Male and female players from various leagues and nations have deliberated over this question, with some extremely intriguing choices along the way, although Steph quickly found an easy way to narrow down the selection process. “I think I’d go with my Northeast crew, because it would be really fun. Not that all five of us are by any means the best players in the world, I just think it would be cool to do a Northeast, Boston-based team. “Alyssa (Naeher) in goal: I’ve never seen a player individually affect scorelines the way she does. There’s like so many games where she essentially swings the scoreline one or two goals; like we won 1-0, we should have lost 2-1. “There are so many great keepers out there but there’s just something about the way she saves things where you’re like, ‘I have no idea how that didn’t go in.’ I’d put Sam and Kristie in the midfield. “As a personality, Sam is very humble and I think people would be attracted to her as a leader because she’s a world-class player and you would never know it, because of the way she carries herself. She’ll never act like she’s better than anyone, she’ll always be the first one to go pick up the balls, or take fault if something went wrong. “I think when somebody’s that good and that humble there’s a natural attraction to that. Kristie, a lot of people say her left foot is her best strength, but I think her greatest strength is that when she’s challenged in any way – whether it’s an injury or a coach says ‘I’m not going to play you for a game’, or whatever it may be – it truly makes her stronger and makes her play better. “Myself up top, and then I think I’d go with Julie King, because she basically is from Boston now. Julie just competes, she’s just like a warrior.